A man died early Thursday when a car crashed into an East Hills convenience store. Emergency crews were called to the 8300 block of Frankstown Avenue shortly after 3 a.m.
Leon Spearman III, 28, was the only person in the car. He was pronounced dead at the scene. Police said the car was traveling outbound on Frankstown Avenue at a high rate of speed when Spearman lost control near Dornbush Street, ran over a curb and struck a telephone pole. As a result, the vehicle flipped and the passenger side of the vehicle hit the building. Spearman was not wearing a seatbelt. According to Washington Police, 24-year-old Aurora McMahon was behind the wheel of a red Chevy pickup truck. After she allegedly crashed into the business, she backed out of the parking lot, got back on Jefferson Avenue and traveled about two blocks before parking under an overpass. Police eventually tracked her down and took her to Washington Hospital. She has since been discharged, but it is unclear if she has been charged. I had to crash through the wall. There wasn’t any other way to get a 6 pack. Two of them reported in today’s ETRT. 1 – Sure, let’s drive 90 mph through Turtle Creek. 2 – One building, hit twice in two weeks. PITTSBURGH —A vehicle backed into a home in Pittsburgh’s East Hills neighborhood late Sunday night. The incident happened along Wilner Drive. The vehicle jumped a curb and went through a window. There were people in the home at the time but no one was hurt. Police have not said if the driver will be cited. The driver, Mr Bozzo (so close) fled the scene but was later returned to it by his father. He’s been charged with a DUI, leaving the scene of an accident (sic) and other counts. The Trib has this photo of the house in Tarentum. I do not see how, if the driver was backing up, the car ended up facing opposite the house 75 feet away. Note also the scrape mark next to the left-most cone. I would sooner believe the driver was going forward, well over 25 mph, veered off the left side of the road, took out the porch, and finally stopped 75 feet later. “He took out the neighbor’s mailbox, hit the road side before barreling into our house,” she said. Simmons said after the truck came to a stop, the driver attempted to leave. “I said, ‘You’re not going nowhere until the police arrive.’ He kept saying, ‘Pull me out, and I’ll go to Sheetz, get my donut and go home,’” she said. BALDWIN, Pa. – An SUV slid off an icy road Wednesday morning in Baldwin and slammed into a house. “It’s unbelievable. 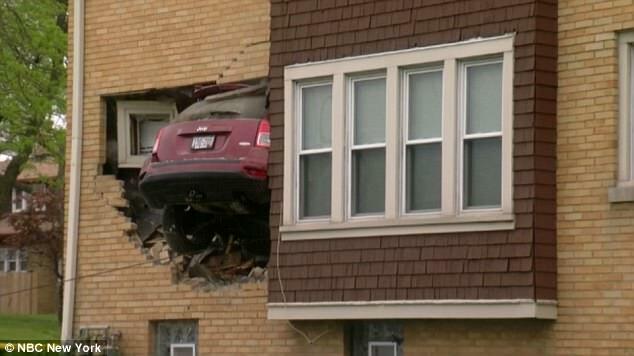 The car was inside the house,” said homeowner Kathy Laboon. She and her husband rent the home on Curry Road to a young family, including a baby who was thrown from his crib by the impact. From Milwaukee, so I considered putting this in the out-of-town thread, but the visual is a better fit here. Apparently it’s difficult for drivers to stay on Penn Ave, as it bends left near Dallas. If Penn Ave we resurfaced in cobblestones, that would slow the cars. I just 311’d this one last week. Another one in the small area near Penn Ave Ext and Braddock Ave in Turtle Creek. Given that the driver fled, I suspect either DUI or unlicensed driving, or both. Red & I saw one yesterday in Carrick, but unfortunately didn’t get a photo. Work van went onto the sidewalk and crashed/wedged itself between a utility pole and a building on Churchview ave. I was going to go back to get a pic, but figured the firemen had enough to deal with. Sketchy details from a tweet, but car into a Springdale pizza shop after a police chase. State police are looking for a Brackenridge man after they said he fled a traffic stop and crashed into a house and garage in Pittsburgh’s Elliott neighborhood early Tuesday. 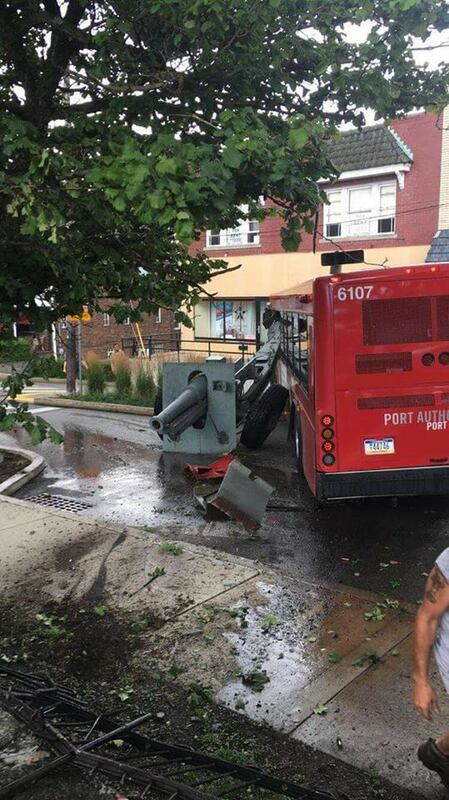 PAT bus hits two cars, then the Brookline Cannon…. pushes it across the street. Was the cannon wearing a helmet? I think they should have to get insurance & a yearly inspection too. Wow. Just wow. How the hell did that happen? Can’t even imagine. If there’s audio of these PG quotes of bus vs cannon we could make a pittsburgh version of the Bed Intruder video. 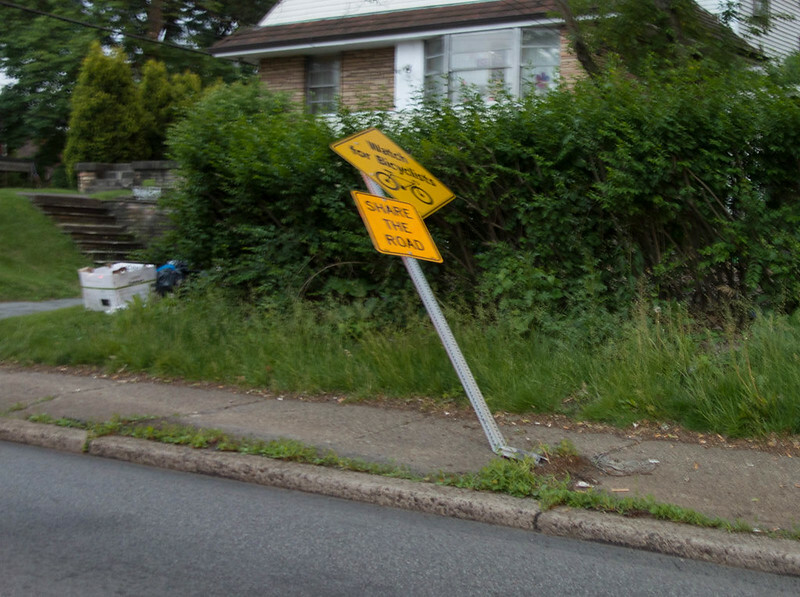 “A bad day for community landmarks” — someone ‘misjudged the turn’ and drove into the large “Pittsburgh’s Little Italy” sign on Liberty at Main St last night. Driver mistakes gas for brake in Beaver biz district. That’s the leading theory behind the floor mat/accelerator stuck Toyota deaths. Car? Heck, no. A paving truck into a house. @edronline – That podcast was a good listen. Heard it a month or two ago. Their assertions didn’t really surprise me, but they definitely convinced me that there is little evidence that it’s the car’s fault. Radiolab has a recent podcast about self driving cars and the trolly problem.